American bike-share is growing—and getting way more contentious. On Thursday, Lyft announced it had completed its acquisition of North America’s largest bike-share operator, Motivate, after previewing the deal in July. Motivate operates the Bay Area’s Ford GoBike, Chicago’s Divvy, Washington, DC’s Capital Bikeshare, New York City’s Citi Bike, and five other US systems. Citi Bike is already the biggest bike-share system in the country, and under Lyft’s ownership, it’s about to get bigger. In an announcement with New York City mayor Bill De Blasio, Lyft said it would pour $100 million into the system, expanding its reach into lower-income (and oft-neglected) outer boroughs, doubling its geographic footprint and tripling its number of bikes to 40,000 over the next five years. “We’re expanding to more neighborhoods outside Manhattan to be able to achieve the equity goals of the system,” says Caroline Samponaro, who heads up bike, scooter, and pedestrian policy at Lyft. The company says it will pour its money not only into expanding bike-share infrastructure, but also into creating relationships with low-income communities to promote bike use and make it easier to cycle there. That addresses a common criticism of these programs, that they cater to wealthy riders in downtown areas. Twenty-four percent of American bike-share systems have income-based subsidy programs, including Citi Bike. But while a Motivate spokesperson said the company didn’t have data on how many people have participated in its subsidy program, the company has admitted that its members skew whiter and richer than the city’s wider population. Not everyone, though, is happy to hear about the expansion. Lyft’s move might hurt the prospects of Lime and Uber-owned Jump in one of the most cycling-friendly markets in the country, where bike-share fortunes might be made or dashed. Both of those companies are part of a city-run dockless bike-share pilot operating in the outer boroughs: Lime in Staten Island and the Rockaway section of Queens, where it has served more than 75,000 rides since June, and Jump in the Bronx and Staten Island, where it has completed more than 40,000 rides. (Citi Bike is also part of the pilot, operating dockless bikes in the Bronx.) That program was just extended by three additional months, in part to examine the viability of electric-scooter-share in the city, which is currently illegal. 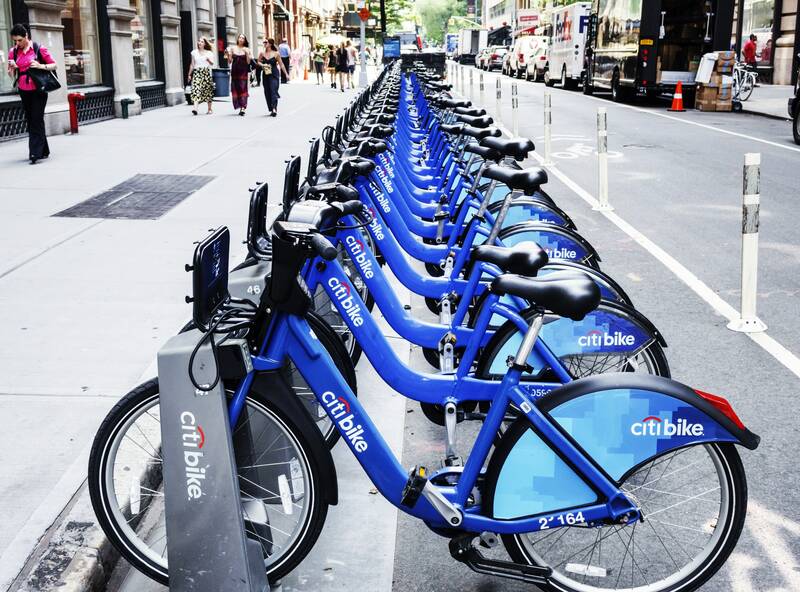 A spokesperson for New York City’s transportation department says Citi Bike’s expansion shouldn’t affect the pilot. But both Uber and Lime say they’ve been snubbed, and that they want to expand service to more lower income New Yorkers. A mock-up of Lyft’s branded dockless bikes, which the company says it might deploy in cities all over the US. “The City should work with all parties to ensure access to everyone who wants to ride a bike to get around their communities—not one company which has long left outer borough New Yorkers stranded,” an Uber spokesperson said in a statement. The spokesperson said Jump was ready to deploy as many as 20,000 ebikes in the outer boroughs. Lyft’s investment also signals that the company has mostly committed to the docked form of bike-share, despite a recent explosion of dockless options. According to the National Association of City Transportation Officials, 44 percent of the more than 100,000 American bike-share bikes are dockless, but they represented just 4 percent of last year’s 35 million US bike-share rides. And if Lyft has its way, New York City bike-share stations will soon be more than places for keeping bikes upright. The ride-hail company wants more than a thousand bicycle docks woven throughout the metro area. (There are currently 750.) “Docks are very important, and they’re only going to become more important as we get more electric bikes,” says Samponaro, who notes that the 200 electric Citi Bikes that currently exist in the system are ridden 14 times a day, twice the usage rate of the non-electrics. Docks will be crucial sites for charging and for rebalancing electric bikes throughout the system. Lyft would also like docks to be destinations. “Docks have place-making benefits,” Samponaro says. “They can help tie together urban planning initiatives, whether those are parklets, or neckdowns.” Lyft, in other words, says it wants to help shape a future that includes more alternatives to cars, like walking and cycling. And if docks make for easy places to pick up and drop off ride-hail customers—well, all the better.